The work boots are designed to protect your feet when you are on active duty. They usually come with a waterproof lining, padded collar, comfort insole, and resistant outsole. They present sturdy look while maintaining the best performance to keep you comfortable even in the toughest conditions. They are developed and manufactured under the world’s iconic brands in the footwear industry as being known for their premium quality at the incredible price. 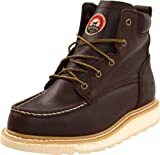 The following is a review of Top 10 Most Comfortable Work Boots in 2018. Check it out! Wear Bates Men’s GX-8 on the beat and stay one step ahead of the bad guys. The boot comes with the famous Gore-Tex waterproof lining and full-grain leather and ballistic nylon uppers combined with full cushioned removable comfort insoles. Other features include the exclusive Ultra-Lites Xtreme outsoles with exceptional stability and traction, so you will not slip up on the job. Bates Footwear is dedicated to the development and manufacturing of uniform footwear to all branches of the military and civilian police forces. Trust the brand, purchase Bates Men’s GX-8 Waterproof Boot today. For an American-made boot that works extra hard, try this full-grain leather design from Thorogood. The boot is manufactured with electric shock-resisting soles and heels capable of withstanding an application of 18,000 volts at 60 Hz for 1 minute. It features polyurethane MAXwear Wedge sole, removable ultimate shock absorption footbed on comfort cushion insole, and MAXWear wedge slip resistant outsole. Like the person who wears them, these best-selling boots are up to the task and built to last. And the stylish, tobacco oil-tanned leather allows your feet to breathe. These iconic boots are Made in the USA by union workers who know a thing or two about what it’s like to be in your shoes. Rock it out, get Thorogood boot now. The 6″ 83605 Boot by Irish Setter® has a classic boot design made with durable modern materials to keep your feet secure and comfortable during your work day. It is crafted with Briar Turbo Vegas full-grain leather and Moc-toe style with triple-stitching detail. Combining with padded collar for extra comfort and a traditional lace-up system with durable metal eyelets, this boot keeps your feet secure and comfy at the same time. The rear pull loop makes it easy to put on and take off. The Goodyear welt construction provides dependable durability. Other features include removable PU footbed for all-day comfort, EVA midsole for superior cushioned support, and white Rubber-EVA Traction Tred outsole. Purchase The 6″ 83605 Boot by Irish Setter® today, the boot of the modern craftsmanship. Bates Men’s GX Work Boot is always ready for active duty! This boot features sturdy leather uppers, outfitted with cushioned insoles, and is finished off with ultra-stable, ultra-tacky rubber outsoles. More than a match for even the most hazardous terrain, these Military Boots are ready for a whole tour’s worth of abuse. Tough Wolverine warrior leather uppers are for outstanding durability in the toughest conditions. Cement bonded combat boot construction is super strong and super durable. ASTM-rated composite toe works a vital safety. Fully-cushioned removable insoles with shock-absorbing pads are made to deal with rough terrain. And Ultra-Lites slip-resistant rubber outsole is reliable traction. Resilient, comfortable, plus a composite safety toe, Bates Men’s GX-8 Work Boot is definitely a great choice. Purchase yours now. 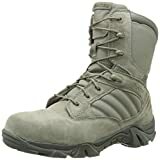 Made with suede leather and ballistic nylon, these Reebok 6″ lace-up tactical military-style boots are designed for maximum comfort and durability. Featuring an ASTM-rated steel toe with electrical hazard protection, moisture-wicking lining and a removable polyurethane cushion insert with shock eliminator heel cushion keeps you comfortable all day. The boot features an XTR brand extra wide composite toe cap, electrical hazard protection and removable Foot Force F2A polyurethane cushion insert with shock eliminator heel cushion for all-day comfort. When it’s time to go into action, the athletically inspired, lightweight Reebok Duty Boots provide positive traction, respond quickly, and offer superior comfort. Reebok Work Duty Boots are ready to withstand the most extreme conditions. Wear Reebok Duty Boots today and bring with you the comfort and fitness into the workplace. Let the others know that you mean business when you set out to work in these sturdy mid-cut SKECHERS® boots. The boot is crafted with a traditional lace-up closure with metal hook eyelets for an adjustable and custom fit. It also features a rounded toe with the front bumper and waterproof leather upper, all for your ultimate comfort. The padded tongue and collar are added for protection and support. Soft man-made lining provides comfort for all-day wear. Cushioned footbed with heel pad provides support with every step. Durable and flexible rubber outsole provides season-after-season wear. This boot is also electrical hazard safety tested. Sketchers is an award-winning global leader in the lifestyle footwear industry. Having a high quality and being affordable, getting this work boot from Sketchers is a smart choice, purchase now. These Caterpillar Men’s Work Boots provide a comfortable design and dependable function that meets the demands of the world today. These classically styled boots from Caterpillar are boots that were made to last. These hardworking boots have a full grain leather upper with a Goodyear welt construction, a Climasphere sock liner, and a slip-resistant rubber outsole for strong footing at all times. It is a quality product with flexibility and design perfect for all types of industrial and service-oriented professions. There should not be any doubt when it comes to boots from Caterpillar brand. Purchase yours now. 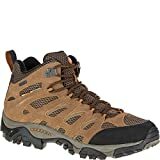 No matter what criteria you have for a splendid hiking boot, Merrel Men’s Hiking Boot is believed to tick all the boxes. This sturdy hiking boot is crafted with leather with synthetic sole. It features breathable mesh and ghillie lacing with speed-lace hardware at top. The bellows tongue is made to keep debris out. M Select Dry works to seal out water, while M Select FRESH prevents odor. To keep you comfortable all day, the Ortholite anatomical footbed is included in this boot. The air cushion heel can absorb shock and add stability. Merrel Men’s hiking boot works really hard to provide you comfort inside out, so wait no more, purchase yours now. Inspired by decades of legendary hiking boots, this hiking boot by Danner partnered with Vibram forges a new path in hiking footwear for men and women. Its Performance Heritage combines the classic styling with lightweight innovation. The Danner Mountain 600 features the Vibram SPE (Specialized Performance Elastomer) midsole, an all-new, technical compound engineered to deliver greater comfort and flexibility. The pliable SPE midsole and flex lines of the Fuga outsole allow your foot to expand to a wider surface, while the unique self-adaptive lug pattern grips at multiple angles. The boot is designed to have minimal seams and lined it with Danner Dry to ensure it could withstand the wettest conditions. Given its highly considerate and innovative function, Danner Men’s Mountain Hiking Boot is the great value you should add to your footwear collection. Introducing Merrel Men’s Waterproof Hiking Boot, the boot that brings quality to an even higher level. This boot features suede leather/mesh, synthetic sole, and Vibram TC5 outsole. The Merrell air cushion in the heel absorbs shock and adds stability given its 5mm lug depth. This boot also includes molded nylon arch shank, EVA midsole, and a protective rubber toe cap. The Merrell M Select™ FIT.ECO+ blended EVA contoured footbed with added zonal arch and heel support. Walk with confidence with Merrel Men’s Hiking Boot, get it today.